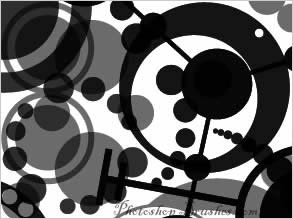 Based on crop circle designs and created in Adobe Illustrator, most photoshop brushes are based on original aerial photographs, then re-created as vector artwork then turned into photoshop brushes. I have always been interested in these patterns and love the shapes that are created, who ever makes them. If these are popular I will add some more complex ones, I know I will be using some of these soon in photoshop battles. Will also be digging out the vector artwork and adding that for download from my site.